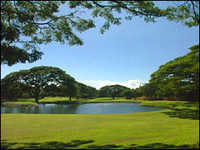 The 18-hole Sea Mountain Golf Course in Pahala, HI is a public golf course that opened in 1971. Designed by Jack Snyder, Sea Mountain Golf Course measures 6416 yards from the longest tees and has a slope rating of 129 and a 71.1 USGA rating. I drove by the course and it was closed. Does anybody know the plans for it? I am a Big Island Resident and drove by the course today and they have a sign posted that the course is closed INDEFINITLY. So call before you go! Very playable. Not the condition of the high dollar resorts but certainly an excellent value. I found Sea Mountain a joy to play when I was there in January 2007 - very windy, challenging, away from the busy touristy tracks & the price was right. I'd definitely play it again if I go back to the Big Island.